One of my favorite motivational quotes is from legendary coach Vince Lombardi, “Perfection is not attainable, but if we chase perfection we can catch excellence.” With the end of the year approaching and as we get into the 2016 planning mode, I thought it only appropriate for my first blog post to expand on this sentiment. 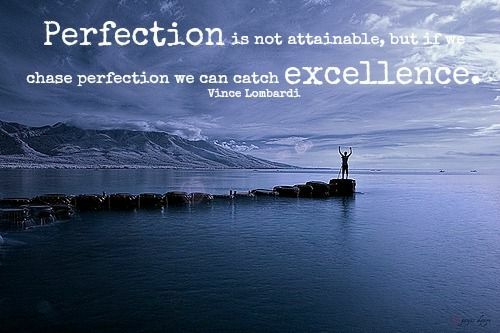 Many of us get caught in the rat race of trying to be perfect. You know the thinking, “if I just lose those last ten pounds, I will be my perfect shape,” or “if I can add two more clients my business will be running perfectly.” Or, how about, “I already screwed up my diet today, so I will start over tomorrow and be spot on.” Well, let’s say you reach your immediate goals, what then? Will everything really be perfect? Chances are, something else will stand in the way of true perfection. And, the race will start all over again. It always does. Because nothing is ever perfect. It’s as simple as that. I am learning this all too well in my battle with perfection. Yes, I admit it. I am one of those perfection seekers. But, recently, I have changed my thinking to strive for excellence not perfection. I am slowly but surely replacing my mindset that all the stars and moons must align perfectly before I take action. For one, there are just so many hours in a day. And, frankly who has time to chase something so fleeting and unforgiving as perfection. I am finding the self-satisfaction in making progress towards my goals, slowly but surely in every day life. Is it perfect? Not even close. But, am I making movement towards excellence, absolutely. Many people never take that first step simply because they are waiting for the perfect timing. Or, they get caught up in that all or nothing mentality. I’ve been there. Here’s a challenge for November. Instead of starting your New Year’s Resolutions all over again come January 1, why not just pick up where you left off, right now. Just Do It!